There are two kinds of work at the cafe where I’m a barista: behind-the-counter work and over-the counter-work. By over-the-counter work, I mean all the tasks that customers typically see. When we make a drink, ring up a sale, or interact customers, the customers are aware of what we’re doing to serve them. But they’re not always aware of the behind-the-counter work that went into preparing for those interactions. It takes time to bake the croissants and muffins we sell, time to grind and brew the coffee, time to stock cups and fruit and half-and-half. Making a chai doesn’t just involve pouring the chai and milk into a pitcher and steaming it. Making a chai involves the behind-the-counter work of measuring out the spices and teas for our homemade blend, brewing it well in advance, steeping it for hours, draining the tea and spices from the pitcher, and eventually chilling the chai. The typical customer does not see all this. I think there’s a parallel here with ministry. In my role as a pastor, I spend a lot of time doing the over-the-counter work. Leading worship on Sunday, preaching, meetings with my co-pastor, meetings with our leadership team, meetings with people from the congregation, spending time building relationships with people outside the church, etc. But in order for all that to go well, I have to spend extensive time doing the behind-the-counter work: prayer, study, writing, planning and strategic thinking. Writing a sermon is like making a chai. It takes a lot of time behind the scenes for the ingredients to steep, to ruminate in a pastor’s mind, to write a good sermon. And just as dishes have to be done at the cafe, emails have to be answered, mail has to be opened, and the church website needs to be updated. The dishes don’t seem exciting or meaningful, but they’re necessary. Sometimes the over-the-counter work means we fall behind on the behind-the-counter work. 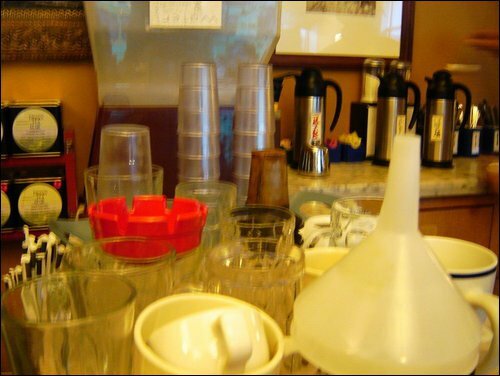 Like yesterday at the cafe when the dishes were piling up, I needed to brew more iced tea, the half-and-half pitcher was empty, and someone came in to order a smoothie. I explained twice to him that he had to choose one ingredient from each column. “Okay, then I’ll have a cherry smoothie,” he said. Annoyed, I impatiently responded, “I can’t just blend up frozen cherries for you. You have to pick one from each column.” Eventually he did, and while I juiced the oranges by hand to blend with the cherries and yogurt, the dishes continued to pile up. Such is life in ministry sometimes. Which is why I’m realizing I have got to be more intentional about making time and space for the behind-the-counter work. I enjoy opening at the cafe each Monday morning because from 5:45 to 6:45, I have an hour alone to do the necessary behind-the-counter work. The door is locked, the sign says we’re closed, but I’m baking, brewing, and preparing for the day. If that time gets shortened, I know it’s going to be a rough morning. Now I need to find a way to make similar space in my church schedule . . .